Before super-heroes donned their capes and took over the world of the comic books, another kind of hero inspired a generation - Popeye the Sailor! In fact, he recently celebrated his 84th birthday, having first graced the pages of the King Features comic strip Thimble Theatre way back in 1929. Over the years he has appeared, not only in print, but also in cartoon shorts and full length movies on the small and big screen, and his face has been used to endorse just about everything from oatmeal to – what else?! - canned Popeye Spinach! His girlfriend Olive Oyl is even older, having been a Thimble Theatre main character for 10 years before Popeye wandered into her comic strip life. Vintage Popeye and Olive Oyl memorabilia is still highly collectible and I was delighted when I received these two figures recently as a gift – thanks Viola and Federico! They might not, strictly speaking, be action figures – they have zero points of articulation – but these bendy or “bendee” figures made of soft rubbery plastic constructed over wire can be posed into any number of positions, so I’ve decided to “bend” the rules a little too with this post! 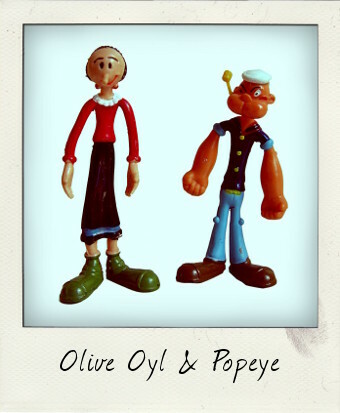 Popeye and Olive Oyl - True Love! Amscan and King Features issued larger 6 ¼ inch Olive Oyl and Popeye bendables in 1978, whilst these smaller 4 ½ inch figures were originally packaged the following year in an unusual way – the bendy couple were both folded into a spoof miniature can of spinach labelled “GENUINE POPEYE CANNED SPINACH SURPRISE”. They're still in pristine condition, with bright colours, no stickiness or rubber rot – Popeye even has his pipe, a missing or broken part on many Popeye bendees.